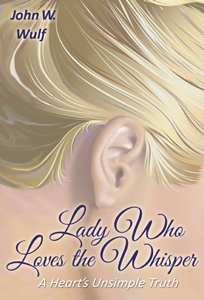 A self-proclaimed romantic, Wulf admits he has “spent a lifetime loving wrong.” The poems collected in Lady Who Loves the Whisper, however, reflect his lifelong quest to love well. His pieces journey from innocence through adolescent angst. He explores yearnings for completeness, and a more recent vision of self-love and acceptance as a pre-cursor to true intimacy. In reading his ever-evolving take on love, the reader is cautioned, “fall not in love with the poet who is not the words you hear in your heart, but is the slayer of your soul.” Readers will find it hard to heed the warning, and will fall in love with his heartfelt words. Quick to admit that he is no expert, Wulf suggests that everyone is adritt on the sea of love—some riding the waves high and dry and some, well, sinking to the watery depths. Despair not, he says, love will find a way, though not necessarily as expected. Complicated and mysterious, it remains part of who we are and haunts, harries, or heals, depending how we perceive it. Wulf has recently reconnected with two friends, atter many years apart, to begin collaboration on a collection of “life” poems entitled Shared Solitude. Solitude, they agree, is mostly illusion. John W. Wulf, born in Williston, ND, spent most of his life in northwestern Montana. He studied social work atter serving in Vietnam, but worked mostly in the timber and automotive industries. Words, music and wilderness have shaped his life. He now lives near Boise, Idaho.